Thoughts from Brahma Kumaris: Cleanliness of the intellect brings accurate decision making. Projection: When the intellect is not clear, it is constantly wandering and it becomes tired. A tired intellect is not able to concentrate properly and so whatever decisions are made at that time are not so accurate. 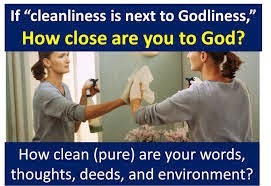 When there is cleanliness within there are no waste or negative thoughts and the entire thought power is used in the right way and so the right decisions are made. Solution: When I am clean within, I am able to experience lightness. Because I am clean and clear within, I find that I do not have any conflict or difficulty in making decisions. Instead I will be able to find the flow of thoughts moving in the right direction very naturally. So I find things also moving in the right direction. In yesterday’s message, we had explained how the Law of Entropy works on a physical level. When theLaw of Entropy is applied to spiritual energy, our virtues, to the quality our thoughts, words and actions, we can perhaps begin to see why, as individuals, we feel tired and old in virtues, irrespective of whether we are young or old physically. We can also understand why we succumb to negative thoughts, words and actions more easily than being influenced by the positive. In fact, the entropy of our virtues i.e. the spiritual entropy has followed the same pattern as the entropy of the physical world or the physical entropy (explained yesterday) i.e. the spiritual energy or the energy of the virtues of the world has been reducing (as the world has become older and older) because it has not been renewed or re-energized from a source outside the system. When we accept this movement from new to old, we understand the journey of time in a completely different way.